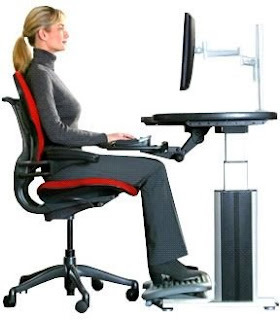 Writing from the Peak: Ergonomics for Writers Part One: Quit Slouching! Writing can be a literal pain in the back. Or wrist. Or posterior. Don’t let bad habits ruin your ability to create. I am fortunate to work at a company that employs a full-time professional ergonomist. Mary Plehal kindly shared valuable information specific to writers. Your particular needs should be verified by your health care practitioner. Perhaps your mother, or some other well-meaning person, urges you to sit up straight. Or outright nags you to quit slouching! Annoying though it is, your helpful posture "policeperson" is correct. Poor posture while you are writing can cause all sorts of problems. How do you maintain correct posture, without the presence of the posture police? I’ll bet just looking at this picture made you sit up straight! I know some of you are going to complain that you have no choice about your seating arrangements. You are a poor starving artist who only has a straight backed wooden kitchen chair, or who has to grab a stool at the coffee shop. Even under the worst circumstances, some of these hints can be implemented. 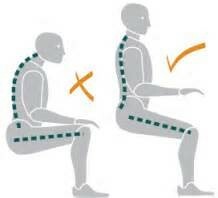 Keep in mind that the goal is to adjust your seating to support good posture. Raise or lower the height of your chair so that your shoulders are relaxed at your sides and your hands are slightly below your elbows when your fingers are resting on the keyboard. If your chair is too high, use a foot rest. The foot rest should be angled, especially if you wear shoes with heels. Knees should be slightly lower than hips. 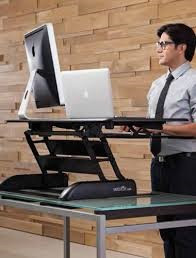 Very tall workers may need to raise their desk surface to accomplish this. 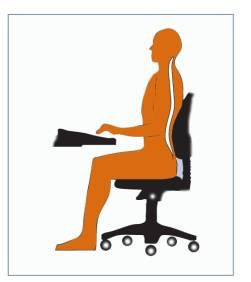 The height of your back rest should place the forward low back curve (lumbar support) of the chair into the small of your back. 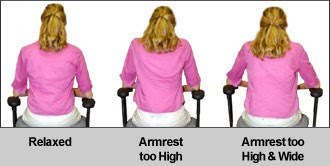 This is the most common chair adjustment error. Most chairs have the lumbar support too low. Adjust armrests to eliminate these problems. If this is not possible, remove the armrests all together. I am fortunate to have a sit-stand desk at work. I wish I could afford to have one at home! These desks allow you to raise and lower the surface. As you’ll learn in another installment of Ergonomics for Writers, changing positions is ideal to avoid fatigue. Consider standing while you write, if you have access to a stable surface of the correct height. Good posture is the key to avoiding physical fatigue while writing. Keep these suggestions in mind as you are creating your next novel. Breaking bad habits takes time. I find it helpful to pin posture reminders near my work area. Join me next month for a continuation of the series. We will cover topics including desk arrangement, eye fatigue, and stretching. 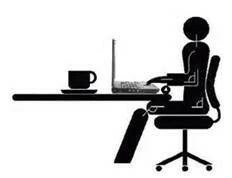 Thanks again to Mary Plehal for her professional advice and illustrations for Ergonomics for Writers! About the Author: Catherine’s fifth published short story appeared in Alfred Hitchcock Mystery Magazine’s May 2016 issue. The second novel in her amateur sleuth murder mystery series, Stone Cold Case – A Rock Shop Mystery, is available on-line via Barnes & Noble and Amazon, and in e-book for Kindle. She anticipates a fall release for book three. With a day job as an environmental regulatory technician, her stories often have environmental or factory-based themes. Others reflect her love of the Colorado mountains, fishing, and running. Wow, this is terrific! Just adjusted my chair (as much as I can, anyway). Thanks, Cathy, for sharing! I never realized how much I slouched. Just call me Sloucher. Thanks for this article, Cathy! I have to admit, my seating arrangement at home is not up to correct standards. I am trying to clean up my writing space, though. The effects of incorrect ergonomics are cumulative. Somehow I notice the aches and pains more at work than at home. You are welcome, Aidyl! It is amazing what a difference a few adjustments can make. Old habits are difficult to change, but it is worth the effort to avoid injury. This is such good advice. I'll see that image of the proper seat position every time I notice I'm slouching. This is a good reminder for any of us working at a desk all day. OK, I officially need a new chair. The seat used to slide forward to support my legs, but it doesn't want to stay there any more. I'm a big time sloucher and have the back pain to prove it. I'll try very hard to use all of this. Thanks for the post! Kaye, so glad the ergonomics info was helpful!